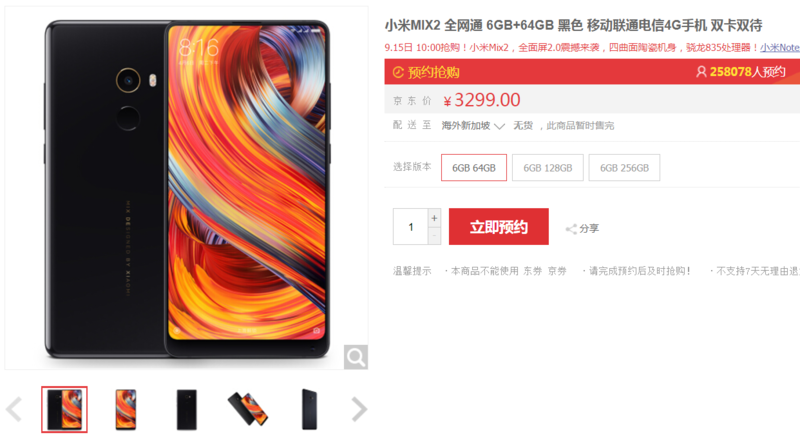 Xiaomi Mi Mix 2 eases pass 250,000 registrations in less than a day - Playfuldroid! Yesterday, Xiaomi finally took the wrap off their most highly anticipated flagship of the year, and its none other than the Xiaomi Mi Mix 2. Although the launch event was co-starred with the Xiaomi Mi Note 2, but the spotlight was still on the former handset. As expected, the Xiaomi Mi Mix 2 had easily crossed more than 250,000 registrations in less than 24 hours after it was made official. This of course, isn’t anything to be surprised of given the popularity of the smartphone and we’re pretty certain it would be sold up rather quickly during its debut sales as well – just like the previous Xiaomi Mi Mix. In case you do not know, the Mi Mix 2 will go on sale in China on September 15th, 10AM local time. Three of its variants including the 6GB+64GB, 6GB+128GB, as well as the higher-end 6GB+256GB model will be up for grab on the same day. The device will come with a price tag of 3,299 Yuan ($504), 3,599 Yuan ($550), and 3,999 Yuan ($611) respectively. Sad to say, the special edition ceramic model with 8GB+128GB memory configuration will not be part of this upcoming flash sale.